This is a "mini" meatloaf recipe for the grill. 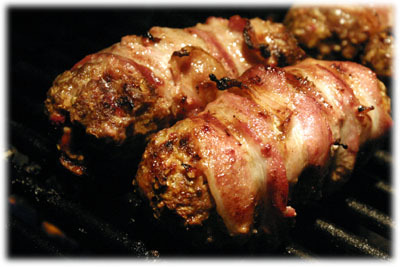 By mini I mean each one is a little personal meatloaf wrapped in bacon then cooked on the grill. 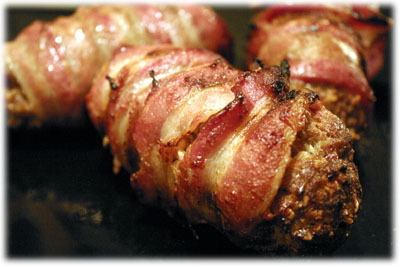 The bacon keeps this meatloaf recipe with oatmeal nice and juicy and the spice blends are very unique. The ground beef is blended with chopped roasted red peppers (from a jar! ), grated Parmesan cheese, various spices (including fennel) and then shaped into individual meatloaf shapes about the size of a baked potato. 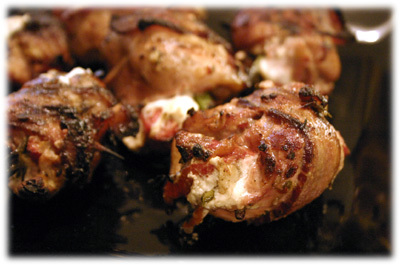 Wrap them in bacon and on the grill they go for about 20 minutes. Consider drizzling this meatloaf recipe with roasted red pepper sauce when they're done. 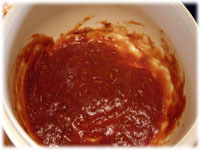 In a large mixing bowl combine the egg, ketchup, onion powder, garlic powder, fennel seed and Worcestershire sauce. Stir well to blend and combine these ingredients. 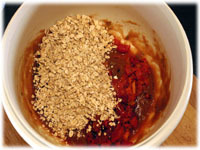 This method ensures when the meat is added all the spices will blend evenly throughout the meat. Add the oats, roasted red pepper and Parmesan cheese. Stir well to combine with the sauce. 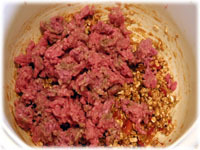 Break the ground beef into chunks and add it to the bowl. With your hands combine all the ingredients until they're well blended. 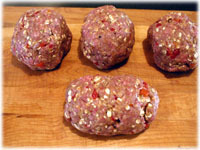 Form 4 balls from the meatloaf mixture. Gently roll each ball into the shape of a baking potato or football. 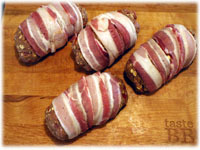 Wrap each mini meatloaf with 2 strips of bacon tucking the ends underneath. 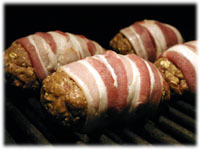 When they're on the grill the bacon will form a bond and seal itself around the meatloaf. 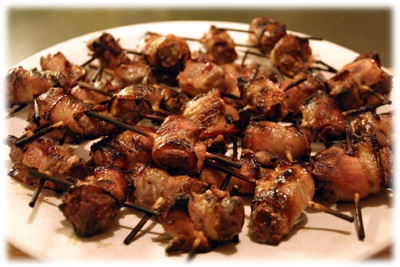 If you have time, refrigerate them covered 30 minutes, they'll stay together better on the grill. Setup the grill for direct cooking and preheat to 375F - 400F. This recipe cooks the meatloaf in about 40 minutes or to an internal temperature of 165F. Cook for about 5 minutes then turn each meatloaf a 1/4 turn. Do this 4 times until each meatloaf is cooked. This is one of the best meatloaf recipes I've ever tasted. The bacon works really well and the spices are fantastic. They don't stick to the grill and while they cook you can make some garlic mashed potatoes to go with them.